I’m so lucky living in the UK that Europe is literally on my doorstep. Europe is so accessible and fairly cheap to travel so at least once a year I like to do a multi-country trip. Sometimes the trip means I only spend one or two days in one of the main cities in the country, but as far as I see it I would rather see some of it rather than not at all. 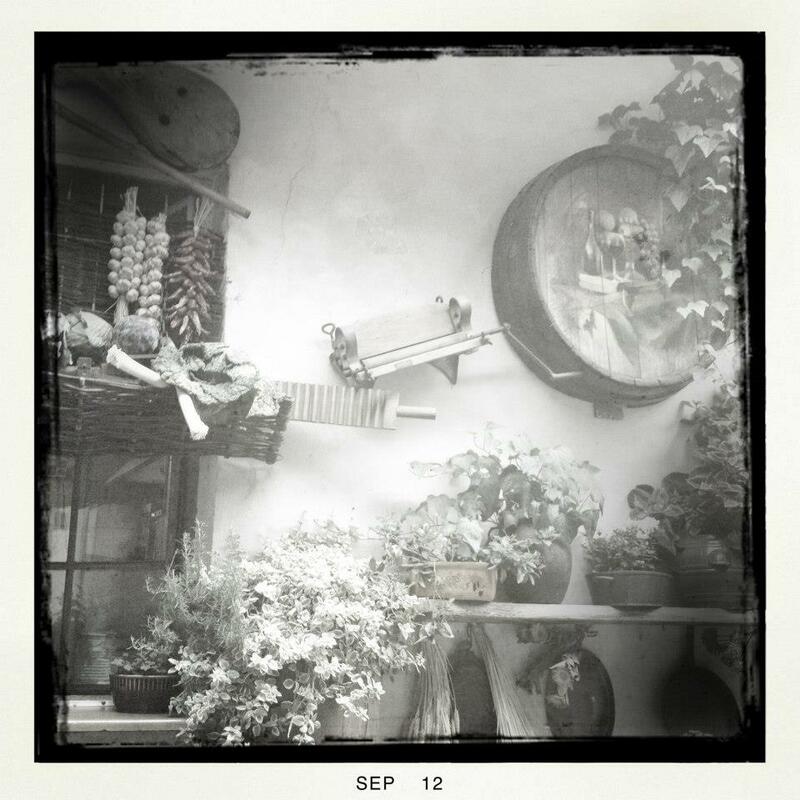 September 2012 we embarked on Krakow, Poland –> Vienna, Austria. Auschwitz was always our main reason to visit Krakow and besides that the plan was to have a little look around Krakow and just hang out and see what the city had to offer. What a surprise! Our hostel was quite centrally located approx 100 metres from Wawel Castle and 15 minutes walk from the main market square in the Old Town. All of the tourist sights are close together and walkable but there are trams if you are staying further out. Entrance to the grounds of Auschwitz can only be done so with a Museum guide. 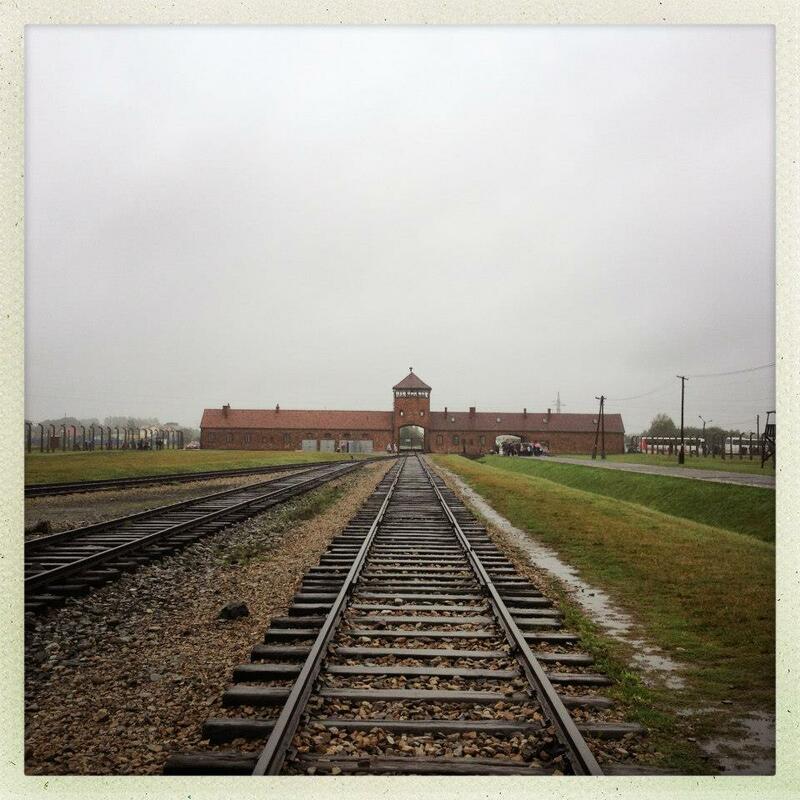 We pre-booked our tour of Auschwitz with a local tour company before leaving home ensuring that we had pick up / drop off and visits to Auschwitz I, Auschwitz II and Birkenau. You can arrive at Auschwitz to visit as an individual but you will be allocated a group to join to be able to tour the grounds. We had one full day in Krakow and then in the evening of our second day we were catching the sleeper train to Vienna. Waiting patiently outside our hostel on the first morning and after 15 minutes had passed after our arranged pick up time we thought it best to check our paperwork and realised we were waiting on the wrong day, whoops! However, this could not have worked out better for us though. The weather was sunny and glorious for a day wandering around Krakow. The second day the weather was grey and the rain was constant. The mood for our Auschwitz trip was set perfectly! 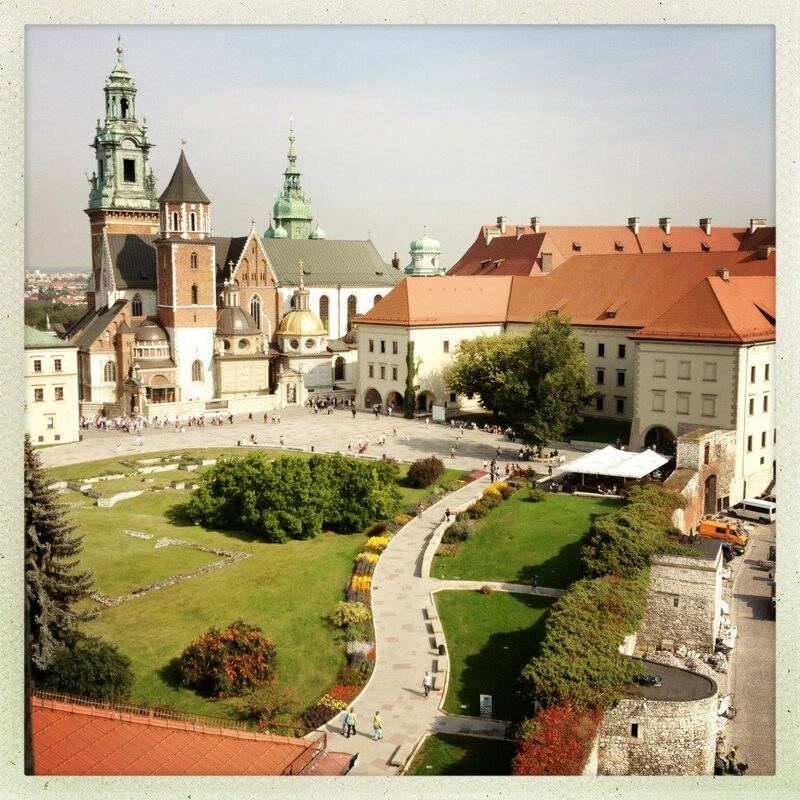 Wawel Castle – Once you’ve climbed the small hill and entered the grounds, what lies before you is a fairy tale like cathedral and castle with beautiful grounds, especially when the flowers are in bloom. There is a statue of John Paul II who was the archbishop of Krakow before becoming the first Slavic pope. We started spotting the same statue in other places and even in Vienna. We didn’t visit any of the state rooms or exhibitions but I can highly recommend climbing the 137 steps up Sandomierska Tower which offers wonderful views across Krakow. Head underground to the Dragon’s Den, literally just to be able to say you’ve visited the den of a Dragon! 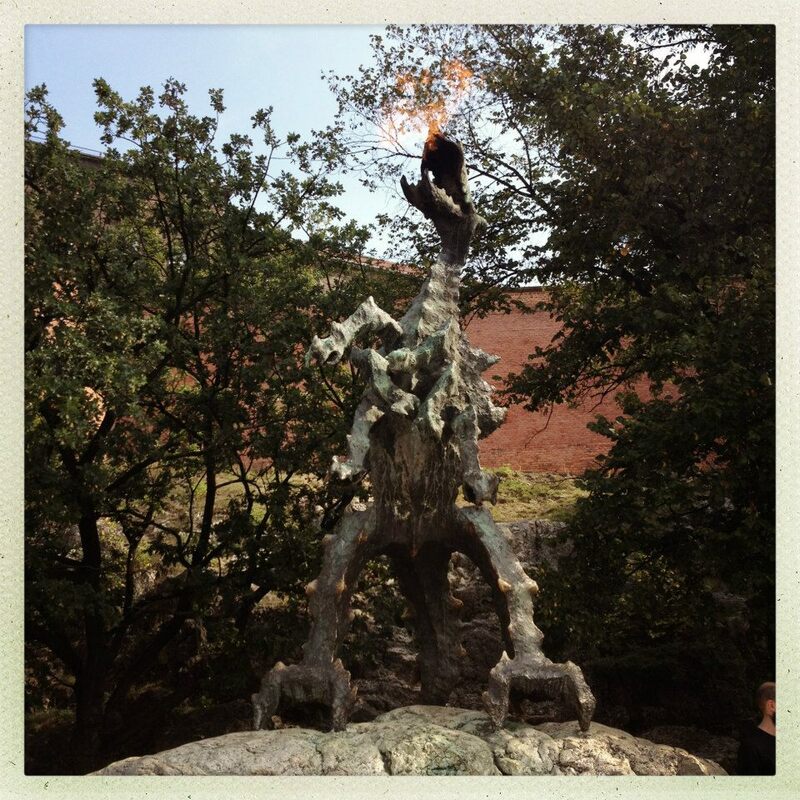 Once you come out at the end, just by the river, there is a metal statue of a dragon which breathes out fire a few times an hour. Main market square – stop for pierogi’s (polish dumplings), beer and people watch from one of the many restaurants around the square. Free wifi in the square – bonus! Wander through the Cloth Hall, full of little shops (and tourist shops). St Mary’s Basilica – on the hour a trumpeter plays out of a window at the top of the two towers. The basilica is worth a visit in side – very ornate and a beautiful gothic alter piece. If you are a budding photographer you can take photos inside for a fee – available when you pay your entrance fee. Free Walking Tour – this Polish company offers several walking tours. We went on the 3pm walking tour through the Jewish quarter – Kazimierz. Meeting point is outside St Mary’s in the main market square. Duration is approx 3 hours and ends at Schlinder’s factory if you want to visit after. Dinner at Stajnia – Kazimierz area. Stajnia is a pub and restaurant which has a lovely outside eating area in a courtyard which may look familiar if you have watched Schlinder’s List. The courtyard links Jozefa Street with Meiselsa Street. Kazimierz has a lot of cheap eats and nightlife options. Today was our day trip to Auschwitz and Birkenau. I spoke earlier about the entry to visiting the concentration camps and booking as a tour. It was pouring with rain, a prime setting for what was going to be an emotional and somewhat harrowing day if you let your imagination loose. I don’t have a personal connection to Auschwitz but it takes a strong person to not let this visit effect you in some shape or form. I took two photos, one of the sign entering the camp and one of the main building in Birkenau. These are mainly to trigger the memory when I look back. I’m not sure how to even start commenting on our day – I’m sure you can all imagine, we all know the history. Dinner at Pod Wawelem Located at the foot of Wawel Hill. 1 litre beers, limoncello and huge portions of meat or fish served with potatoes, rice, vegetables and sauerkraut – all for 4 english pounds! It has an outside eating area, which is also covered when the weather is bad. Sleeper train to Vienna – 8 hours. You can pre-book tickets through Polrail. You need to register an account but it’s very simple and I haven’t received any junk mail from them since. There is the option for 2, 4 and 6 bed couchettes, also standard seats. We booked two beds in a 6 bed couchette for 760 PLN which was approx £150. Polrail emailed back to say that they found us a discount “SparNight” ticket at nearly half the price and they would refund the difference – which much to my surprise they actually did! Could you imagine any of our UK train companies doing that – if the tickets went on sale after you booked your ticket, tough luck! The tickets were to be held at the local post office…..
Our taxi driver dropped us round the back of the train station thinking he was being ever so helpful as it was raining and it was a direct route onto the platforms. With our lack of Polish language skills we couldn’t explain to him we needed the post office. We must have walked back and forth through the tunnel to the platforms at least six times looking for an exit. I can’t remember exactly how we found the exit, but we did, and eventually stumbled across the post office. Luckily we factored in enough time for such eventualities and delays. For a Friday night at about 8pm the post office was so busy! In hindsight I wouldn’t book a six bed couchette again. The cheaper price meant we were put on the top bunk (out of three), which was very close to the ceiling. It was hot and the main light was on throughout and we weren’t allowed to walk from carriage to carriage. Plus we had a snorer!! Arrival time in Vienna was 6.30am and we were staying in a hotel with a check in time of 2pm….. If you’re on a budget, tight on time and not a light sleeper like myself – do it (take a sleep mask and ear plugs! ), otherwise I would travel through the day (scenery is a bonus) or book a private couchette.